Dr. S. C. Jamir, His Excellency the Governor of Odisha presented the award in the august presence of Hon’ble Dr. Justice Dalveer Bhandari, Judge, International Court of Justice, The Hague; Madhu Bhandari; Diego Palacios, UNFPA India Country Representative and Country Director, Bhutan; C. J. Venugopal, Principal Secretary to the Governor, Odisha; Padma Shri Jitendra Haripal, singer; Saswati Bal, President, KIIT & KISS; Prof. Achyuta Samanta, Founder, KIIT & KISS; and R. N. Dash, Secretary. Ms. Judd is a popular American actor who has played leading roles in Hollywood hits like Ruby in Paradise, Where the Heart is, Kiss the Girls and Divine Secrets of the Ya-Ya Sisterhood. Apart from her unforgettable performances in highly acclaimed films, the former Golden Globe and Emmy nominee has been involved in global humanitarian work since 2004. Her initial work revolved around AIDS in Africa. She is strongly committed to the cause of social justice, poverty eradication and sustainable development and a passionate advocate of rights of the girl child and women. Associated with numerous charities and foundations across the world, she was appointed Global Goodwill Ambassador for the UNFPA in 2016. A student of KISS presenting a portrait to Ms. Ashley Judd. 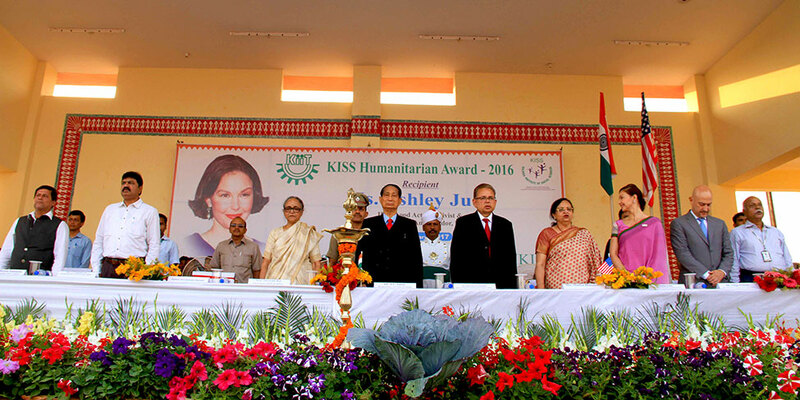 Ms. Ashley Judd receiving the KISS Humanitarian Award 2016 in the presence of esteemed dignitaries. Ms. Ashley Judd lighting the traditional lamp at the ceremony. 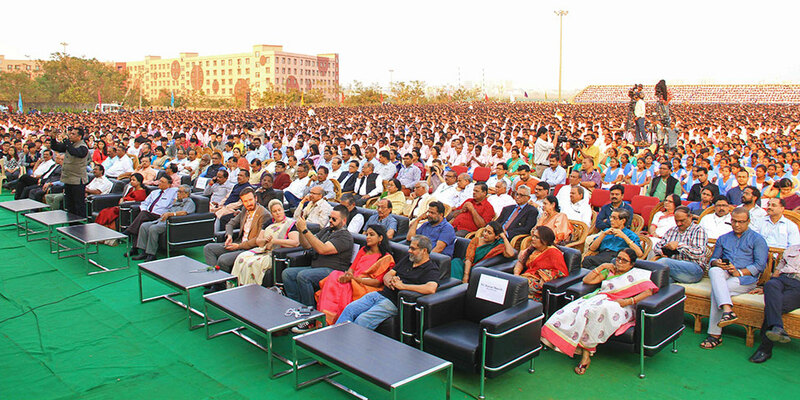 (L to R) Dr. A. Samanta, Founder, KIIT & KISS, Shri C. J. Venugopal, IAS, Principal Secretary to the Governor, Odisha,Smt Saswati Bal, President, KIIT & KISS, His Excellency Dr. S. C. Jamir, Hon’ble Governor of Odisha, Hon’ble Dr. Justice Dalveer Bhandari, Judge, International Court of Justice, The Hague, Smt. 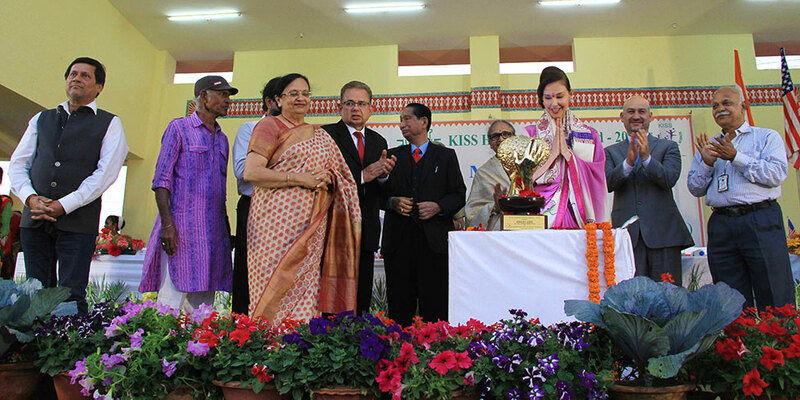 Madhu Bhandari, Ms. Ashley Judd, Hollywood Actor, Activist & Global Goodwill Ambassador, UNFPA, Mr. Diego Palacios, UNFPA India Country Representative and Country Director, Bhutan and Mr. R. N. Dash, Secretary, KIIT & KISS during the award ceremony. 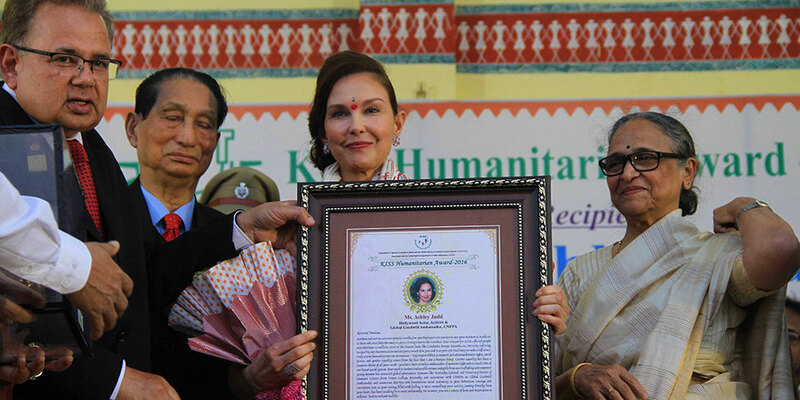 Ms. Ashley Judd, Hollywood Actor, Activist & Global Goodwill Ambassador, UNFPA receiving the KISS Humanitarian Award 2016 from Dr. A. Samanta, Founder, KIIT & KISS on 9th February 2017. Ashley Judd is well known for dexterously starring in both box office hits and for turning in unforgettable performances in fine independent films. From her debut in Sundance Film Festival grand jury prize winner, Ruby In Paradise, to Where the Heart Is, Simon Burch, Helen, De-Lovely and Divine Secrets of the Ya-Ya Sisterhood, her films tell very personal stories– which is exactly what Judd does when she is not making movies. But the stories she tells are not about being a Golden Globe and Emmy-nominated actress or about making People magazine’s “50 Most Beautiful People” list three times. She has also served as a board member for Population Services International (PSI) and as Global Ambassador for YouthAIDS. Ms. Judd speaks on behalf of those who cannot speak for themselves. She is a graduate of the University of Kentucky, and in 2010, earned an MPA from Harvard’s Kennedy School of Government. Her paper, Gender Violence, Law and Social Justice won the Dean’s Scholar Award at Harvard Law School. Judd has traveled the world to do international public health work on all fronts– maternal health, child survival, human rights, family planning, STD and HIV prevention and malaria prevention and treatment. She is also passionate about the environment. An eighth generation Kentuckian, she is an outspoken critic of mountaintop removal coal mining. A proponent of a “green collar” economy, Judd is committed to helping find innovative renewable energy solutions. She frequently serves as an expert panelist at international conferences, is a sought after public speaker and is a widely published OpEd author, with a diverse and unique social media presence. She has spoken at many prestigious conferences around the world, including the London School of Economics’ Family Planning Summit, sponsored by the Bill & Melinda Gates Foundation. She also hosted a talk with President Clinton on the work of the Clinton Foundation for the London School of Economics. In 2012, she spoke on the floor of the Democratic National Convention as the delegate from Tennessee asked to cast the ballots for the party’s nominee for president and vice president. A native Kentuckian, Ashley currently resides in Tennessee. Ashley is a PhD student at the University of California at Berkeley at the Goldman School of Public Policy.